Robert McCloskey is a name that you probably recognize, even if you can't place his books immediately. But once I spout off some titles, such as Blueberries for Sal, or Make Way for the Ducklings and you'll probably nod and know exactly what and who I'm talking about. Born in 1914, he won three Caldecott Medals: the first was for Make Way for the Ducklings (1942), the second for One Morning in Maine (1953) and the third for A Time of Wonder (1958). McClosky was born and raised in Ohio, actually (which should make some of my Ohio friends right proud!) When he was in high school he took an interest in art. He won a scholarship to the Vesper George Art School in Boston. From there he went on to the National Academy of Design in New York. He married a lady (and fellow author!) by the name of Margaret (Peggy) Durand in 1940 and they were married for 51 years before Peggy died. The two of them made their home in New York before World War II, but but after the war was over they moved to Maine. The couple had two daughters, Sarah and Jane. (Blueberries for Sal was modeled after his wife and daughter Sarah.) During the war, McCloskey served in the Army where they put his skills as an artist to work drawing training pictures! 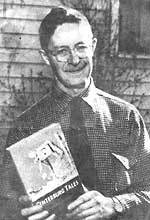 It was during World War II that McCloskey wrote and had published Homer Price (1943). Recently, we've had the opportunity to read through some of McClosky's books that we had never read before. For starters, I found an older copy of Burt Dow, Deep-Water Man at a local used-book store. I was delighted to see that it featured a sperm whale (and so was Bookworm1!) The story is kind of long so I wasn't sure how well my 3 1/2 year old would take to it, but I needn't have worried. McCloskey has a certain charm about him. His writing style if unique and subtly humorous. I read somewhere that he is considered an original American humorist. I think I would be tempted to agree after reading his books this past month. Now, I had never read Homer Price until just last week. I figured it was time to rectify the situation and promptly did so upon picking up a copy. I found this story as a whole to be downright charming and totally unbelievable. 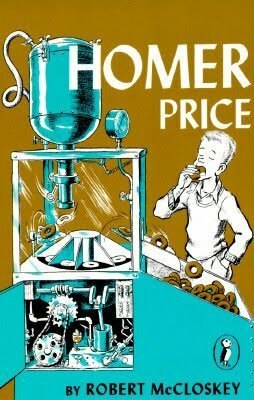 If you aren't aware of who Homer Price is, suffice it to say that he's a young lad with remarkable ability to locate problems, create/fix/solve them in ridiculous ways. The adults around him never seem to know what's going on or what to do about it. Truly, it's unbelievable. But! Instead of being rankled by the fact that McCloskey suspends belief, you just find yourself chuckling along. He has a way of making the ridiculous humorous and so you find yourself just going with the flow of things. As it turns out, one of the chapters from this book - The Doughnuts - was turned into a short film. I found the 1963 clip on Youtube and it's HYSTERICAL. For one thing - it follows the storyline very well. The actors are entirely perfect for their roles. However, it still has a 1963 quality and feel to it. I am including it here for your education and amusement. =) I wonder what McCloskey thought of it! I'm really enjoying getting to know more about this author, through understanding his personal life a bit better and educating ourselves on some titles that we had not previously read. Robert McCloskey seems like a fun guy and we're happy to know him. Oh, how we have LOVED this author! My teenagers both have fond memories of his books... While I adore my teens and this stage of life, I sure do miss having wee ones around all the time to read with! As much as I loved Robert McCloskey's books when I was little I forgot about him for my own children! They had that film on video at the library my kids and I went to when they were young. They watched it over and over. McCloskey was one of our favorite authors. LOVE. LOVE. LOVE McCloskey!! One day this summer I am taking my children to Boston to follow Make Way for Ducklings and see the statues. We also read his books set in Maine before our vacation to Maine last year. I love our copy of Make Way for Ducklings, because we bought it in Boston as a souvenir, because we spent time in that park. It makes it a bit more special.